The Shimano Tekota Levelwind Reels are solid, technically advanced, palmable levelwind reels designed to keep you trolling comfortably for years. Built on a rugged 1-piece die-cast aluminum frame with aluminum and graphite side-plates for maximum strength and minimum weight, the Tekota Levelwind Reels featurea unique crossbar-forward design that provides direct access to the spool, a non-disengaging levelwind system with underbrace for better line management, oversized clicker, and a non-slip Septon ergonomic power handle. "I've used my model 600 with 25lb. test for over two years for fresh and saltwater fishing and I'm very impressed with this reel. I use it along with my vintage Ambassadeur 7000C3 but I have grown to favor the 600 due to its drag smoothness, castability, and reliability (just like my 7000C3)." 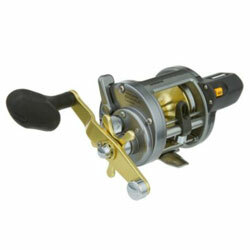 "I have a Shimano Tekota 500 and 600 both non-linecounter models. All I can say is wow! I love these reels! They are incredibly tough. I use them for catfish of all sizes. I have the 600 paired with a 7' M Ugly Stik Tiger Lite and it is a perfect match. " "I started making the switch to Shimano reels 2 years ago and the TEK500 was one of 1st 3 models I bought. I'm very happy with this reel."